In deciding what to make for a Valentine’s Day-themed What’s Cooking Wednesday, I knew chocolate would have to be involved–it has a reputation as an aphrodisiac, you know, even if it technically isn’t. 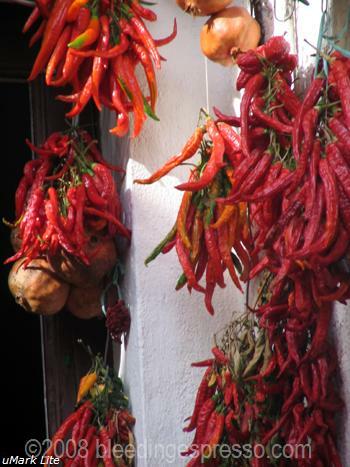 But peperoncino, or hot pepper, *is* known to get the romance flowing, and if there’s one thing that isn’t difficult for me to find in Calabria, it’s peperoncino–I’ve even written a tribute to the pods that pack a punch here. So I found this recipe for Mousse di cioccolato e peperoncino and then I found this basic chocolate mousse recipe in English. I went about picking and choosing from the two recipes and came up with what I present here. It’s *so* good, I’m going to have to make it again for tomorrow night’s dinner. This just may be my new favorite dessert in fact. If you’ve never had spicy chocolate, let me assure you that you don’t actually taste the hot pepper–it just gives the chocolate an extra zing, something that tickles your tongue after the rich chocolate taste has passed. And what better gift to yourself for Valentine’s Day than a tickled tongue? And I’ll leave it at that (wink wink). 2. Once the chocolate is melted, set it aside to cool a bit, and now whip the cream and set it aside. 3. Beat the egg whites until foamy and then sprinkle in sugar and beat until soft peaks form. 4. Once the chocolate is room temperature, stir in the egg yolks, and then fold in about 1/3 of the whipped cream and half of the egg whites until just mixed and then add the rest of both the cream and egg whites. 5. Put mixture into serving dishes and let chill in the refrigerator overnight or for about 8 hours (up until 24 hours). 6. 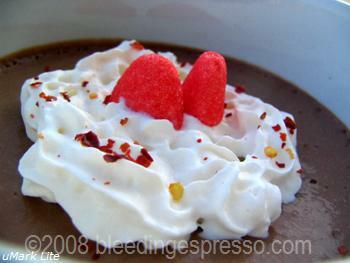 Before you serve the mousse, add some whipped cream on top and a sprinkling of peperoncino for an extra kick. P.S. If you’re more in the mood for a cake this Valentine’s Day, check out last year’s Valentine’s Day Chocolate Cake (also made with coffee) as well as this Nutella Spice Cake, which also has a kick of peperoncino. Oh my! Be still, my beating heart! Hah, I’m craving chocolate and I just ate some of this! Looks good and will definitely be in the arsenal. I love spicy chocolate but never think to add peppers to my recipe. I posted a recipe for pots de creme au chocolat a couple of days ago that while nice by itself might actually be stellar with a little cayenne pepper added. It is a much denser dessert than a mousse but the recipe is very similar it is just that you don’t beat the cream. I’ve always been intrigued by the spicy chocolate concept but never taken the plunge. After your post, I think I might finally be ready. Sounds delicious! You definitely should try it LJ–it gives such a great kick to the chocolate! I agree with LJ. I think that is a very interesting combination. Yum. nyc/caribbean ragazza’s last blog post..Ciao! Welcome to Italian bureaucracy. Looks like a great recipe! I sometimes add a little chocolate to spicy foods like chili, so why not the other way around? I think I’d love a little spice in my chocolate. Susan at Sticky, Gooey, Creamy, Chewy’s last blog post..Who Needs No-Knead Doughnuts? Ooh, I think I may just have to do it the other way around too! Sounds great! Just this year for the first time I tried spicy chocolate and I loved it…it was a chocolate bar “Perugina Nero al peperoncino”. Not only were we on the same blog wavelength today, but I just came back in before seeing your comment on my blog from going to our local spice shop and buying a cocoa and hot pepper drink mixture! LOL. And yes, that kick is SO good. Well, this is definitely more sinful than mine… but I think i’m going to have to try it! can’t wait to try that……..looks and i bet smells amazing. Spicy and chocolate!!! Two of my favorite things together? Oh My…I’ll definitely be making this! Did you know Lindt has a spicy chocolate bar? It’s delicious and like you said, just has that extra “zing” in it. YUM! I’m going over to download that cookbook now. Hey, it’s for a good cause! Karina’s last blog post..Some business to attend to – A Valentine’s Day Giveaway! No I haven’t seen that chocolate bar; I’ll have to tell my mom about it though since I’ve been talking up spicy chocolate for a while now…. wow, great news about the Barilla cookbook. Do you mind if I post that on my blog? Not at all Joanne–please do! So tempting, I love a bit of spice. This is just the thing to get us all fired up for Valentines night and the spicey, peppery twang negates all the calories, right? No cooking involved Scarlett (melting chocolate doesn’t count) 😉 Come on over! The mousse looks delicious! I like spicy chocolate, but don’t cook it much. I downloaded the cookbook too. thanks for the info. Happy Valentines Day!! Glad you like the mousse and that you downloaded the cookbook–looks great doesn’t it? my screen saver for valentines’ day. low-cal food from you in italy JUST FOR ME over here in florida. That would make for one HOT Valentine’s Day! Funny about peperoncino and chocolate mix as I heard, on 880 news radio from NYC, that a place in Texas is selling chocolate covered chillies. Happy Valentine’s Day! Chocolate and peperoncino do go very well together, and I’m glad to see you promoting their pairing. Promoting it I am! YUM. Just to clarify, then the pepperoncino is not IN the mousse, it is in sprinkled on top? spicy chocolate rules the school! there’s a little coffee shop near my apt. that makes awesome mexican hot chocolate and chocolate-cinnamon scones, yum. and i love the idea of the hot pepper in a mousse, or maybe a pot de creme. Michelle @ Us vs. Food’s last blog post..The Welshly Arms is known for its spiced meats, act 2. My next adventure will be some spicy hot chocolate. Now if someone would deliver chocolate-cinnamon scones…. I may have licked my monitor. Hah! I hope yours is less dusty than mine…. The chocolate you brought up with you from Calabria was all fabulous, but my favorite was the one with peperoncino. It was beyond. Beyond I tell you. So this sounds very enticing to me. I must have been in a construction daze three years ago when you posted it originally, because I don’t remember it.